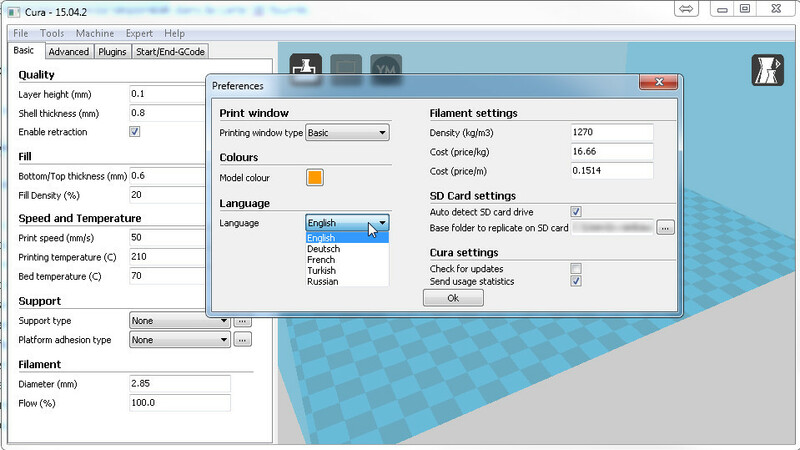 The slicer provided wit the Scalar 3D printe is Cura developped by Ultimaker and also maintained by the comunity.. The version described here is 15.04.02 available on the SD card provided with the kits. 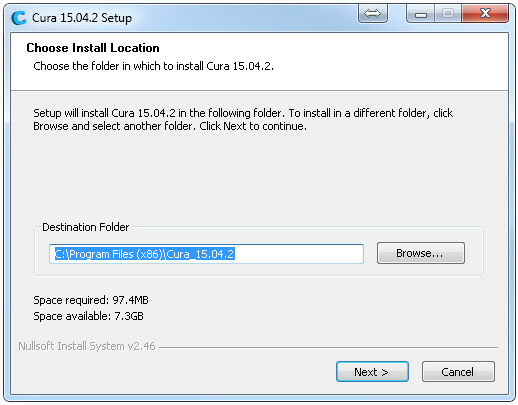 The previous panel is displayed asking you for the installation folder. Select the one most appropriate for you. 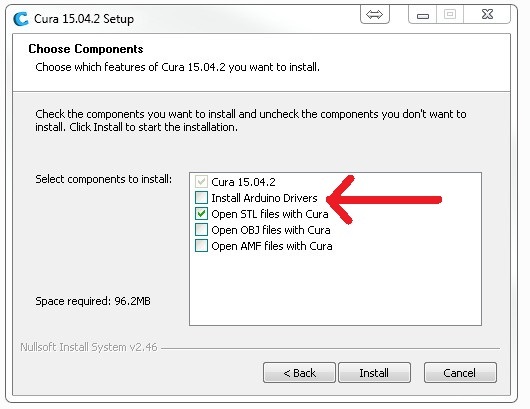 A second window is then displayed displaying a list of components to install.It’s advised to Uncheck the Arduino Driver installation checkbox. It’s better to install them separately from the Arduino IDE. A last window is displayed telling you that everything is ON. 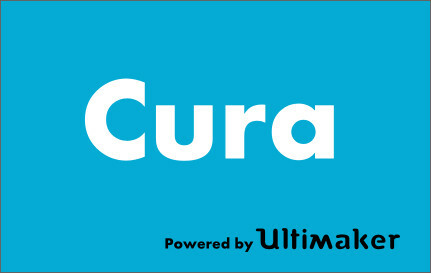 Push « Finish » to start Cura. 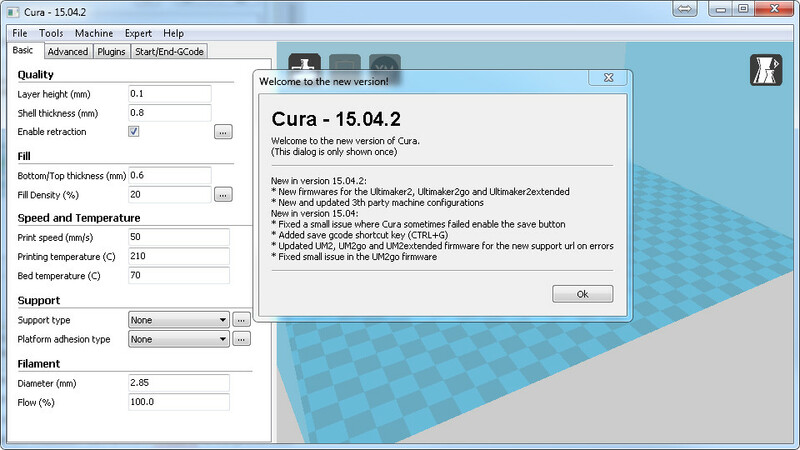 Cura Starts and a welcom screen is displayed giving you the current release note. Push « Ok » button to finally start Cura. Under Linux and Mac OS, the procedure is very similar. A new window pops up containing a drop down list with the currently supported languages. We are going to show you how to load a profile from elements provided into the SD card. The process is very similar with files from Git. You will then get a list of profiles close to your machine. 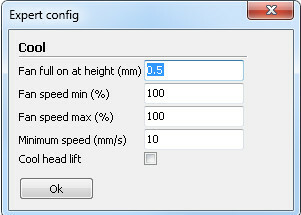 After loading the profile, the default parameters should be updated. 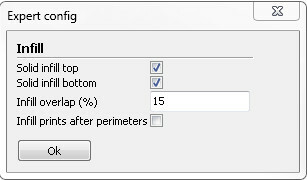 Layer Height: This parameter defines the overall quality of your print by acting on the height of each layer. This value depends on the size of your nozzle, but a 0.15mm is a good starting point with 0.4mm/0.5mm nozzles. Shell Thickness: Defines the thickness of the shell in mm. This parameter must be a multiple of the nozzle size. For a 0.4mm nozzle, if you want 2 pass on your shell, you need to provide 0.8mm thickness.. Enable retraction:Allows to enable/disable filament retractionwhen the nozzle is moving over void spaces to prevent plastic dripping or creating thin strings when moving. 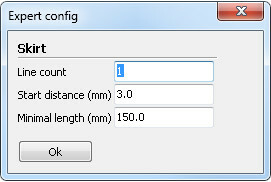 This parameter is very important for printers with Bowden tubes. Clicking on the button on the right with « … » will open a window with retraction advanced parameters. The interesting parameter in this pannel is « Z hop when retracting ». This parameter allows to move up the hot end when the hot end is moving over the void. This prevent the nozzle to hit or damage the layers already on place. The other default parameters are rarely changes. Bottom/Top thickness: is the thickness of the top and bottom of the plastic part that will be 100% infilled.It’s interesting to note that the « top » part of the object might require 1mm/1.2mm at least depending on the infill percentage. Also, 3D printers are capable of printing into the air up to a certain point. So this aspect will also affect this parameter. The Layer height will also have an impact on this parameter as it give the total amount of layers that will be used to fill in the top and bottom of the object.. Fill Density (%): Corresponds to the infill percentage inside the object itself. If you are using « 0% », you will get an empty object with only the shell. In the opposite 100% will give ayou a plain object. There is some aspect to know when using infill in Cura. Using 25% or 26% will give you a totaly different infill percentage. Changing from 25 to 26% will give you a far more dense infill that going from 10 to 11%. 26% seems to be some stage. So using 26% infill should cope most of your needs..
By pushing the button on the right with « … » you are going to open a panel with advanced parameters related to infill. Solid intill Top/Bottom: Defines the thickness of both Top and Bottom of your part. 1mm is Often a good starting point. Infill Overlap: This parameter corresponds to the percentage of overlap between 2 lines of plastic side by side on the same layer. It allows to increase the bound between these. In general 15% gives good result. However if you start seing the infill pattern on the shell of the object, you might consider lowering this value to 10 or 5%. Infill prints after perimeters: This parameter tells the slicer to perform infill before or after the shell of the object. The default value (check box unchecked) should give proper results. 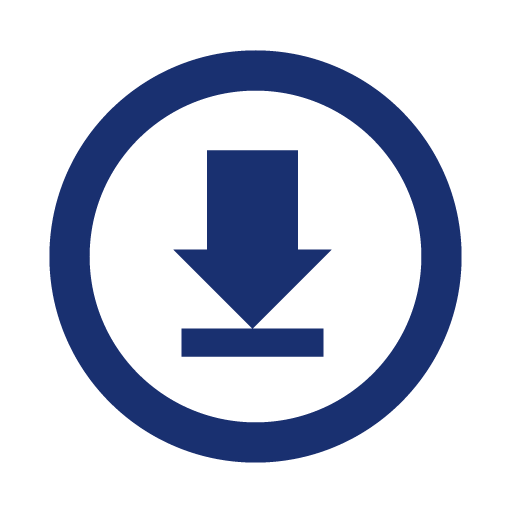 Print speed: Give the default print speed. A 50mm/s value is a good starting point. You need to know that this is a default value that will be used on some other speed parameter if left to 0 on the Advanced tab. Printing temperature: This is the temperature of the HotEnd when printing. 210°C is a good starting point for PLA and 230°C will help you print ABS.Note that you may want to tweak this parameter depending on your plastic brand/color/material. Bed temperature: This parameter is the Heatbed temperature when printing. In general for PLA, 50°C/60°C will give good results. ABS requires 110°C however.This parameter will also vary with materials. The only purpose of the heatbed is that it helps to keep the plastic part stuck onto the print surface. Heatbed for PLA is said to be optional, but to us it’s mandatory if you want to start a several hours print. You can also add some hair spray to increase adhesion to print surface. Note however that only some airSpray model/brand will work and some will do the opposite. 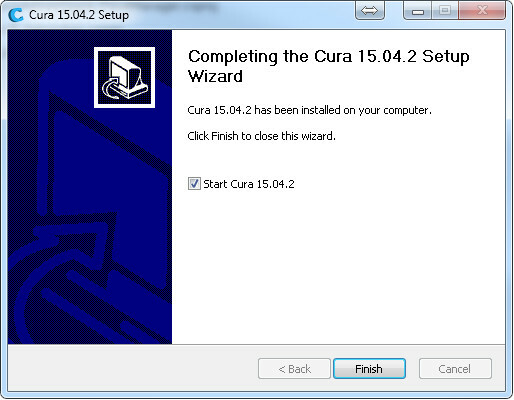 None (aucun): default case: Cura won’t generate any support. Touching buildplate: Will only create support for where support structure is touching build plate. Everywhere: Will generate support everywhere. The « … » button will open up a new windows with advanced support settings. 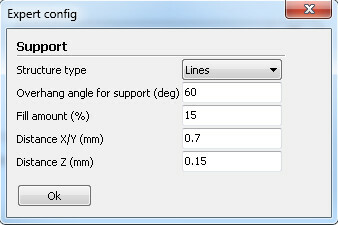 Overhang angle for support : Allows to defines the angle at wich the support will be neede. The default value is often fine. Fill amount: Amount of infill of the support. The more dense, the harder it will be to remove it. The less dense and the harder it will be to get a flat printing in the air. Distance X/Y: Defines the space between the outter shell and the support. Smaller the value, closer the support will be from the object. Higer the value, further away will be the support from the object. This parameter will impact the quality of the object near the support. Distance Z: Defines the same way how far the support will be from the bottom of the object. Platform adhesion type: Allows you to choose between 3 types of platform adhésion. 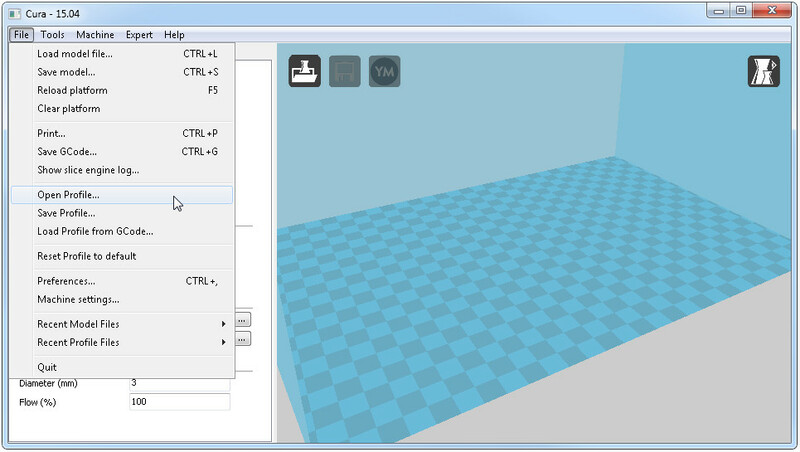 This parameter mainly helps you to get your object stuck on the print surface. This is helpfull when printing object with very small ground surface like a ball sor something similar. A heatbed will help but if the ground surface is too small, the part can still be moving during the print. None : Nothing is done by the slicer. Brim: generates concentric lines touching the object. This is increasing the ground surface of the object. WIth this option, the bottom of the object is touching the build surface. Raft: Generates some spaced lines below the object to increase the ground surface. The object won’t touch the build plate with this option. It’s often used for ABS printing and it also reduces the curling effect of the ABS when the ground surface is important. Button « … » at the right opens a new window with additional « Skirt » feature parameters. Skirt will create on the first layer only a few lines around the object. The lines are not intended to touche the object. The main goal with the Skirt is that it makes sure that the nozzle is under pression when starting to print the actual object. At the begining of the print, some plastic will exit the nozzle but often in an inconsistant way. After a few lines (depending on the nozzle size), the Plastic flow will start to become constant. At that moment you can start printing the object. Line count: Defines the amount of lines generated by CUra around the object. Value 3 is a good starting point. Of course the optimal value depends on many factors such as : the ground surface, the nozzle size etc… The bigger the ground surface the smaller can be the line count. The smaller the nozzle, the more line count you will need to use. With large nozzle (0.8mm or higher) you can use « 1 » as a good starting point. Start distance: Distance between the lines and the object. Minimal length: Minimal distance the Skirt line should be. 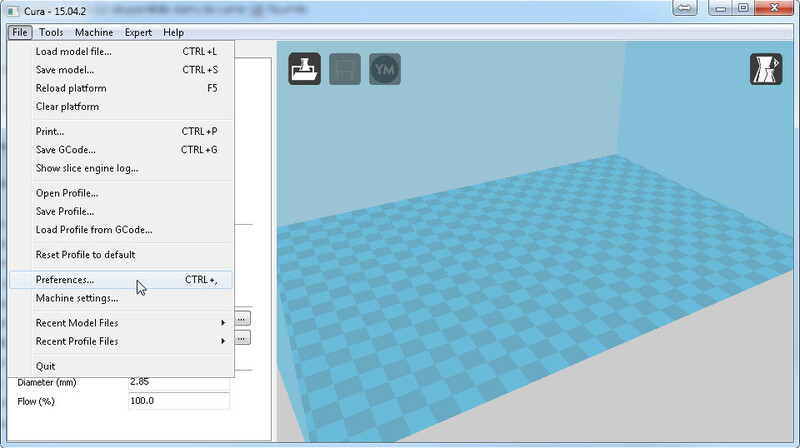 If the amount of line count doesn’t reach this minimal distance, Cura will generate some more to reach this distance. The default values seems fine. Diameter: Filament diameter. It’s a critical parameter as it really impacts how much plastic will be used when printing. You can have some slight differences with plastic spools, so taking a few measurements with a calliper and rounding it can give you a nice result. Nozzle size: This is the nozzle sier of your hotend. It’s also a critical parameter as it’s a based parameter used in any calculation. Speed: Retraction speed on the extruder side when it needs to pull in and out the filament before moving in mid air. If the speed is too high, the stepper motor might either damager the filament, slip or even get stuck. This will result often is some lack of filament when pushing back the fillament into the nozzle. If the speed is too low, you can get some drips (blob) or strings when the hot end is moving. Using 45 is a good starting point. Distance: Tells how much to retract. the filament. Note that the full metal hot ends can get jammed if this value is too high. The PLA can expand if it cools too fast, causing it to get stuck inside the hot end. This can be the case for E3D or AllinOne, Use a value or 2 or 3 maximum. For seme metal hot ends such as AluHotEnd, you can go up to 9 or 10 without troubles as the PTFE liner inside the hot end prevents the filament from expanding. Initial Layer thickness: If the height of the very first layer. It’s interesting when you are using big nozzles. It’s often interesting to have this value lower than half the nozzle size. 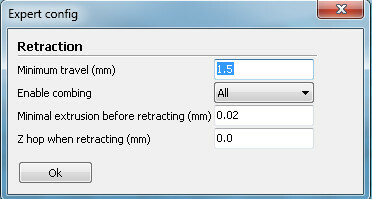 Caution, Changing this parameter can affect the « Z offset » value of your firmware used by « auto bed leveling » (ABL). Initial Layer line width: Is the width of the first layer. Can be usefull if you see some lack of filament between each lines. Note however that this parameter should remain 100%. 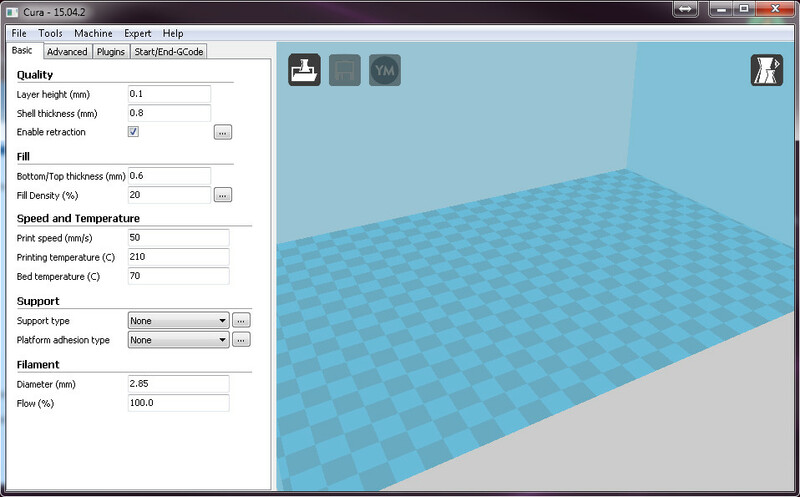 Cura However doesn’t seem to handle big nozzle properly and using this parameter can help. Cut off object bottom: Allows to cut your object at the bottom before starting your print. This allows you to start printing higher on your object. Dual extrusion overlap: Gives the overlap between 2 lines when using multiple extruders / colors. For all these parameters, using value « 0 » will replace this parameter by the default « Print Speed » value from the « Basic » tab. Travel speed: Is the speed of the machine when moving in the air.It really depends on the geometry/rigidity, etc.. of the printer. For Scalar XL use a value between 80/90mm/s. If you go higher you will encounter some brutal deceleration causing a lot of vibrations. For Scalar M 90/10mm/s is a good starting point. Bottom layer speed: Is the printing speed of the very first layer. Having a low value here ( between 20 to 40mm/s) garanties you that the first layer will properly be applied on the print surface and that it will also stick properly to it. Infill speed: Speed of the machine when it’s performing Infill. This value can be higher than the rest of the parameters. Top/Bottom speed: Is the speed used to the top and bottom of the object. Here Speeds near 40/50mm/s is a good starting point. A speed too hight will generate holes when filling up the top of the object. Inner shell Speed: Speed used for inner shell. Often this value should be very close to « Outter shell speed » otherwise it can impact the outter shell finish. Minimal layer time: The minimum time spent by the printer on each layer. For PLA this can help to cool down the plastic before a next layer. It’s interesting when you have no auxiliary fan to cool down the PLA. Enable cooling fan: Allows to enable/disable the use of auxiliary fan. Note that this fan is often used for PLA but never used for ABS. Button « … » opens advanced parameters for auxiliary fan management. Fan Full on at height: Allows to define the height where the fan will be at full speed. Fan speed will gradually increase from 0 to Fan speed Min value, so that it achieve full speed when reaching this height. Fan Speed max: Is supposed to be the max fan speed. On the field you will see very little changes between min and max speed, so using the same value for both will give your the result you expect. Minimum speed: Is the minimum speed of the printer. Below this value your print can deteriorate. Cool head lift: WIll lift the head when reaching the minimum speed to prevent damaging your object. Cette entrée a été publiée dans Software le 12 October 2015 par Nicolas Rambaud.